While we spend countless hours deliberating over the perfect prints for our living room gallery walls, we rarely put the same effort into the walls in our bathroom. Whether you have room to spare or you're working with a small space, a bathroom wall can actually be the perfect blank canvas for a little bit of personality. You can keep things minimalist and modern, like this classic bathroom from SF Girl by the Bay, by adding a single sophisticated print above your bath or sink. Or you can experiment with bright bold colors and mix in wallpaper and vibrant watercolors. No matter how much space you have, here are some of our favorite ways to fill an empty wall in your bathroom. This bold bathroom from Paper & Stitch gives us major vacation feels. It's bright and full of personality, but feels entirely intentional in its eclecticism. Consider adding a pop of pattern with wallpaper, either throughout the entire bathroom or just on the upper half, as seen here. And though you may not have considered your bathroom as a place to display your favorite art, leaning a few interesting pieces on a ledge or behind your toilet can instantly upgrade a bathroom without a renovation budget. There's nothing we love more than a room filled with rich greenery, and bathrooms are no exception. 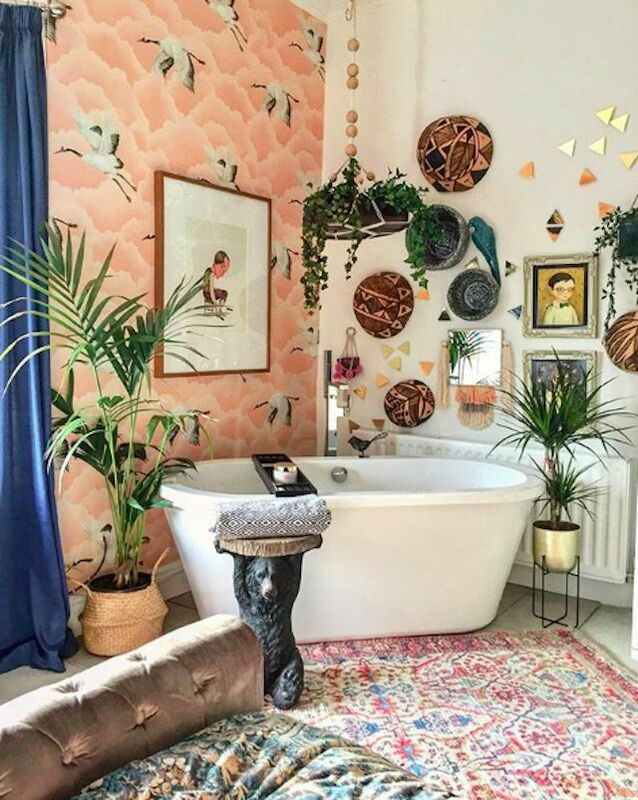 This bathroom by knottyplantlady feels like an exotic jungle escape and doesn't take a lot of money to recreate. Opt for bathroom-friendly plants, such as spider plants, and look to ceilings, shelves, vanities and even the floor to add pops of green. Filling your empty wall space with greenery is a great way to transform your bathroom and make it a place you'll never want to leave. This bathroom by nudeandthenovice is one of the most visually interesting spaces we've seen. From the unique eye-catching gallery wall to the bold wallpaper to the oversized art print, there's nothing about this bathroom that feels cookie cutter. Because you most likely have much less wall space in your bathroom than in any other room of your home, it's a great place to experiment and add a load of personality without spending a ton of money. You don't have to choose between form or function when it comes to bathroom wall decor. This rustic wall hook from Bless'er House adds visual interest and is incredibly useful. If you're short on wall space, consider adding decor that doubles as a shelf or a hook. By focusing on beautiful and functional items that match your style, you can make the most of your space both aesthetically and in practical terms. 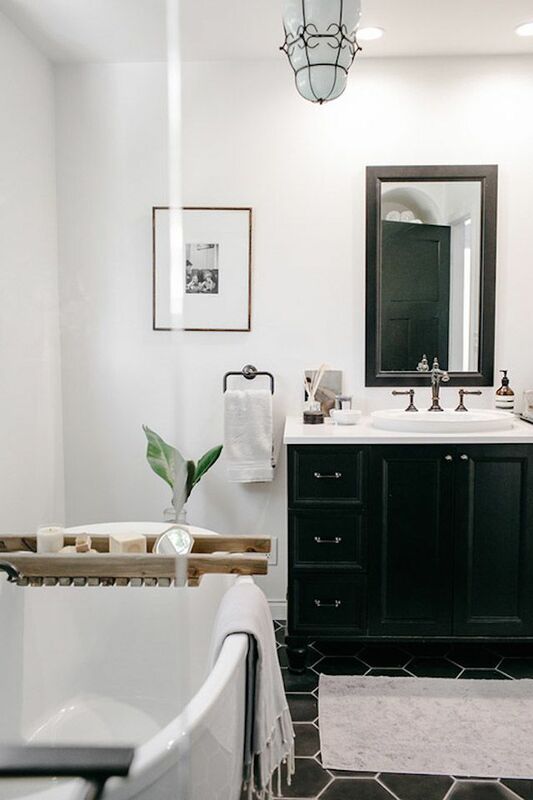 This modern bathroom from Little House of Four uses a print with boldfaced text to add a little visual interest and personality without taking away from the minimalist, monochrome vibe. Check out Etsy or make your own printable wall art with your favorite quote or saying—the cheekier the better. Adding wall decor to your bathroom can be as simple as picking up a print you love and displaying it loud and proud in your space. This leafy watercolor quickly transforms betonbargainhunt's bathroom and adds depth and warmth to the space. Next time you pick up a piece of artwork you love, consider hanging it in your bathroom instead of your living room. Bathroom wall decor doesn't have to be a piece of art or a colorful wallpaper. Instagrammer onemillhouse proves that expertly designed and laid tilework can result in a showstopping work of art. Creating a border around the tilework creates the illusion that it's been placed in a frame, and makes the space feel even more high-end. Don't have a lot of empty wall space? Don't be afraid to layer and lean artwork on the floor against your walls. This sunny bathroom from houseofspolland features a cheeky print that lends endless personality and bit of fun to the already-perky room. If you have enough floor space, consider a leaning picture or a floor plant to add a little extra decor. We love this children's bathroom from makingprettyspaces. Not only is it perfectly chic and quaint, but the monogrammed print is a great way to personalize a bathroom. Floral wallpaper is also a great choice—it's fun, inviting and adds texture to any space. When shopping for bathroom artwork, think outside the box. This llama print from jstoppard_designs is the perfect way to put a smile on your face before every shower. Don't be afraid to pick wall decor that doesn't "feel" bathroom-y. The more creativity you put into it, the more your bathroom will feel like an intentionally-designed space. Wall decor doesn't have to be just decor. We love this rustic leaning shelf from Bre Purposed, which adds useful storage space and fills up empty walls at the same time. Make your bathroom storage work double-duty by adding a few small prints or a vase of flowers. Here's another bathroom wall decor idea that combines function and beauty. Instagrammer thenotsobighouse filled empty wall space with two shelves that not only add a little bit of extra storage space but also provide a perfect canvas for knick-knacks and artwork to lend visual interest. Curate your shelves with pretty candles, greenery and more to give the room even more depth. This bathroom from Paper & Stitch proves that your bathroom is the perfect place to display your favorite art. We love the idea of hanging a portrait in the bathroom—it's a little unexpected, but lends an unexpected sense of sophistication to the space. When picking out fixtures for your bathroom, consider ones that add a little something extra to your space. This marvelous bathroom from A Home to Grow Old In features stunning sconces and a bold mirror that give the bathroom personality and chicness (without breaking the budget). Mix in a beautiful vintage-inspired wallpaper and voila—you have a space fit for the pages of a design magazine.